Hanauma Bay is a true paradise for divers and is not accidentally declared one of the best America’s beaches. It is located about 15 km east of the world famous beach of Waikiki and is an incredible natural pool formed in a volcanic crater. Translated from Hawaiian Hanauma bay means curved bay. However, a whole bunch of legends are brought about the way this place has received its name. For the locals it is part of their history and in the past Hanauma Bay has been an excellent place to fish. 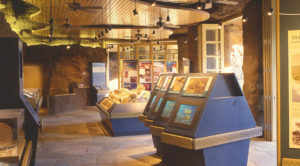 The archives show that in the 18th century the Hawaiian kings have often come here to have fun and sports. In fact, the bay is a beach park and a nature reserve, which aims to protect the fragile and beautiful ecosystem in the area against unlawful influence. For this purpose, every guest at this fabulous place is obliged to watch a short educational film before heading down the steep road to the magnificent coastline. If you do not want to walk, there is a tram, which, for a sum of 50 cents in one direction will take you down to the beach. The hiking trails along the ridge and along the coast offer breathtaking panoramic views of Hanauma Bay. People can learn more about protecting this beautiful place, at the recent discoveries Marine Education Center. Only 1 ID per person per day is permitted. There are no refunds. Hanauma Bay hours of operation are specific. It is open every day except for Tuesdays, Christmas and New Year’s day. Public visits are forbidden during holidays. The bay is closed for tourists every Tuesday with the idea of preserving the environment unharmed. Open from 6am to 6pm. Open from 6am to 7pm. Hanauma Bay is a real tropical jewel composed of a white beach, lush vegetation, extraordinary marine wealth and coral reefs. Nearly 450 types of tropical fish will make you company if you dive into the warm waters. Some of them are endemic to the Hawaii region. Here you can also see humuhumunukunukuapua’a – the fish considered a symbol of Hawaii. While snorkeling in the bay you can encounter turtles, including the rarely seen Green Sea turtles. The Hawaiian Islands are visited by about 8 million tourists from around the world, each year. 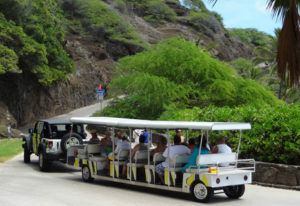 And while some prefer the exotic comfort and luxury of Waikiki in the southern part of Oahu, others prefer a little paradise in the southeast of the island called Hanauma Bay. This place is for those who really want to enjoy scuba diving and snorkeling. 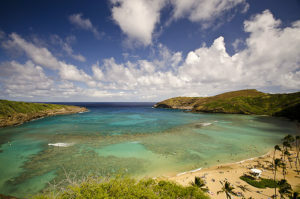 In 2004 Hanauma Bay was named the best beach in America. This is one of the best places in the world for diving and snorkeling. Parking fee is refundable if vehicle is exiting the parking lot within fifteen (15) minutes. 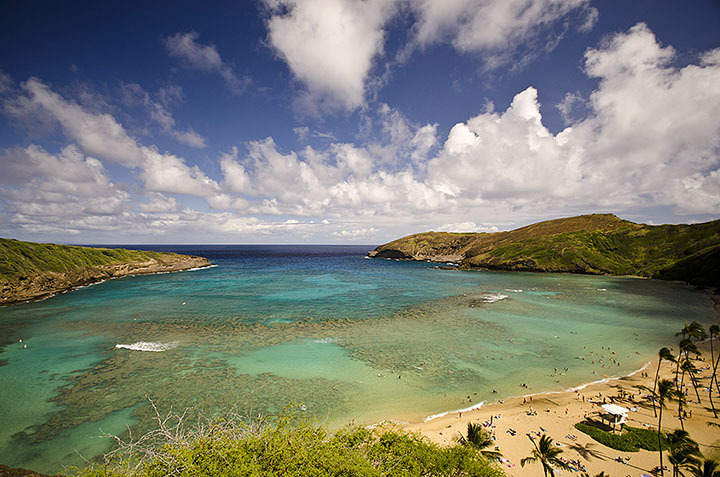 About 3 million tourists have visited Hanauma Bay per year. But today their number is drastically reduced to nearly 1 million. About 3,000 people on average visit the beach each day. Some of them do it by car. And if you travel by car as well, be aware that the Hanauma Bay parking is relatively small and fills early. And the bad news is that if there is no place to leave your vehicle you will not be able to dive into the Bay. So if you want to go by car, the best time to do so is between 6:00a.m. and 7a.m. After that time, the chance to find a free parking space for your car are minimal. If you want to use a GPS navigation, the address you should enter is 7455 Kalanianaole Highway, Honolulu, Hawaii. Or you can enter the following coordinates: 21.2690° N, 157.6938° W.